Last summer and autumn I took part in the Transworld Reading Challenge, in which I got to choose four novels from a selection of their titles and then review them. One of the titles I chose was The Water Room by Christopher Fowler, featuring his slightly odd detective duo, Arthur Bryant and John May. Having thoroughly enjoyed it and intending to read some more of the series, I then promptly moved on and forgot all about it. Fast forward almost a year and I arrived home the other day to find a package waiting for me. Tearing off the wrapping eagerly, I discovered that the lovely people at Transworld had very kindly sent me a copy of Bryant and May and the Invisible Code, the latest book in the series. 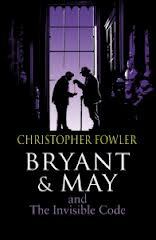 For those of you not acquainted with the series, Bryant and May are the two senior detectives in the little-known Peculiar Crimes Unit of the Metropolitan Police, whose function (other than its perennial fight for existence) is to solve, well, peculiar crimes really. Bryant and May are both old men who have somehow avoided mandatory retirement. Bryant is irascible, fascinated by the esoteric and prone to ruining technology by some mysterious innate ability. May is the “people person” of the duo, a bit of a ladies’ man and seemingly forever doomed to play straight man to Bryant. They are assisted in their endeavours by a small but devoted crew of police officers and some decidedly odd acquaintances. It is definitely possible to read Bryant and May and the Invisible Code as a stand-alone novel but I think there’s more to be gained from it by reading others in the series first. The story opens with the death of a young woman in a church, apparently from natural causes, despite two children claiming that they had cursed her to death for being a witch. Bryant’s curiosity is piqued but he can’t manage to finagle the case into the Peculiar Crimes Unit. Conveniently for him, the PCU’s nemesis, the saturnine Oscar Kasavian, needs their help as his spouse has begun to behave in a most peculiar fashion, jeopardising his chances of heading a major government initiative. As the two situations become increasingly interlinked, Bryant and May take us on a romp through London involving witchcraft, codes, the Rakes Club and secret nooks and crannies around London as the case starts to threaten not only the future of the PCU but even the lives of its members. As with the other Bryant and May book I’ve read, Bryant and May and the Invisible Code is a many-layered tale, a little like the London to which this is a bit of an extended love letter. It is a genuine detective story on one level, an affectionate parody of detective tropes on another and even a little bit of a supernatural tale on yet another. But, permeating the whole of the book, London is Fowler’s true subject. Like China Mieville, Dickens and others, Fowler captures a number of London’s myriad faces. His London is not the bright lights of the West End or the aristocratic enclaves of Belgravia and Kensington but a moodier, more hidden London where, even when it’s sunny, there is an impression of shadow. It’s a London filled with the quirky, a London that sits on layer upon layer of history and life. Having failed to follow up with Bryant and May once before, I’m not going to make that mistake again and will be catching up with their earlier cases very soon.